Pamper yourself with onsite massages or take in the view from a rooftop terrace. 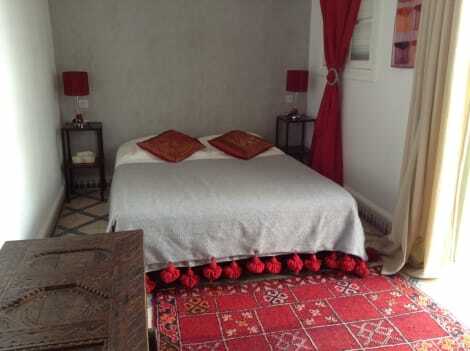 Additional amenities at this riad include complimentary wireless Internet access, a television in a common area, and tour/ticket assistance. Getting to nearby attractions is a breeze with the area shuttle (surcharge). This luxurious hotel enjoys a great setting in Marrakech, lying just a 10 minutes' walking distance from Jemaa El Fna Square. The hotel is located within easy access of the main attractions that this mesmerising city has to offer. Guests can explore the shopping opportunities with ease, and discover the rich culture and heritage of the city. This charming hotel enjoys a spectacular architectural style, combining traditional Moroccan design with contemporary influences. Commanding spectacular views over the Atlas Mountains and the Medina, this magnificent hotel enjoys a peaceful ambience. The hotel welcomes guests into a world of luxury and style, comprising beautifully-appointed rooms, which offer a cocoon of tranquillity. The hotel affords a number of exemplary facilities, meeting the needs of every type of traveller. Treat yourself to a stay in one of the 7 guestrooms, featuring fireplaces. Satellite television is provided for your entertainment. Conveniences include safes and desks, and housekeeping is provided daily. Riad Dar Nimbus A warm welcome awaits you at the small, 3x000D star Riad Dar Nimbus in Marrakech. The hotel offers off site car parking. Guests can enjoy a meal at the hotel restaurant. Room Facilities Riad Dar Nimbus. Smoking is permitted in both the bedrooms and the public areas of the hotel. Please specify when booking. Wifi internet access is available in all rooms. Leisure Info. Leisure facilities are available at the Riad Dar Nimbus. Relax in the luxurious hotel sauna. An outdoor swimming pool is available for hotel guests. Other Info. The hotel offers an airport shuttle service. The hotel is pet friendly. A concierge service is provided for guests. Enjoy a meal at the restaurant or snacks in the riad's coffee shop/café. A complimentary local cuisine breakfast is included. Not far from the vibrant souks there is Dar Zemrane house. With its cozy comfort and refined hospitality you will feel at home. Astonishing terrace views will seduce you and shaded patio will offer well needed relaxation. Dar Zemrane Hotel has modern rooms fitted with individual climate control, a laptop safe, a patio, a dressing area and a work desk. The rooms offer a bathtub, a shower and a hairdryer supplied in the bathrooms.A delicious breakfast is served every morning. Guests can wine and dine at Dar Marjana and Riad Kniza Restaurant, located in the neighborhood.There is Marrakesh train station nearby. Guests can reach Menara airport within 10 minutes' drive.